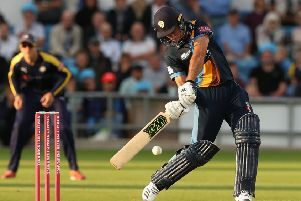 Captain Billy Godleman said he was pleased to be playing with consistency after his second hundred in this year’s Royal London One-Day Cup led Derbyshire Falcons to a 51-run win at Northamptonshire to keep them firmly in the hunt for a place in the knockout stage. It was an impressive all-round display from Derbyshire, led by Godleman, who made a career-best 137 in the opening game of the competition at Edgbaston and followed up with an unbeaten 125 from 142 balls to steer his side carefully to 265 for 2 on a slow wicket. That score was easily defended with all six bowlers taking wickets as Northants subsided for 214 to leave their chances of qualifying for the knockout stage hanging by a thread. Godleman said: “We’re delighted. I think in every discipline we showed our skill and most-importantly showed the attitude and determination that we’re creating and building at the club. “We’ve played enough cricket now to know when to know when there’s a difficult surface and this wasn’t easy to strike off the front or back foot. We had 275 in our mind as a winning score. Godleman steered Derbyshire, having won the toss, with typically nugetty effort — a few memorable strokes but a most-determined effort. He got going with a flashing cover drive off Ben Sanderson, struck another boundary past mid-off and made a fierce pull backward of square as Derbyshire finished the Powerplay on 37 for 0. Boundaries were at a premium but he swung Josh Cobb over mid-wicket before bursting the hands of short-fine leg for his ninth four to move to 98 before raising his third List A century in 127 balls. His opening partnership of 182 with Ben Slater was the record first-wicket stand in this fixture. Slater, fresh from his century against Yorkshire on Wednesday, began his innings with two firm pulls but otherwise was content to run the bowling around and build the partnership. He swept Graeme White for four and pulled Cobb over midw-icket. A leg-side flick off Nathan Buck raised his sixth List A fifty in 78 balls with five fours. He then switch-hit Rob Keogh to the backward-point fence but completely missed a full toss from the same bowler and was clean bowled for 94. Northamptonshire head coach David Ripley said: “In the Powerplay we were tidy but we had nothing in the wickets column and that’s been a theme - not being able to get among the opposition early. “I thought it was an over-par score but if we started well, it wasn’t a ‘ginormous’ score. Northants’ chase, as was the case in the previous match against Durham, was in early trouble. Rob Newton chipped Wayne Madsen to mid-wicket for just two and Josh Cobb clipped Ravi Rampaul to mid-on for six before Alex Wakely, after a stand of 51 for the third wicket, tried to reverse-sweep Matt Critchley and was plumb lbw for 19. Ben Duckett, who has endured a miserable season so far, got set by driving Wayne Madsen — who bowled a seven-over opening spell for just 21 runs — over extra-cover before reverse-sweeping Critchley’s leg-spin three times for boundaries in going to just a first half-century of the summer in 59 balls. Duckett and Adam Rossington shared a partnership of 53 for the fourth wicket before Duckett lifted Alex Hughes into the hands of long-on to fall for 57 and Rossington, having reached a fortuitous 40, swung at Duanne Olivier and lost his leg stump. 107 were needed from 11 overs and despite Rory Kleinvedlt striking two leg-side sixes, he couldn’t rescue Northants.